Moles live underground and inhabit the lawns of residential homes, parks, golf courses, and cemeteries, as well as fields, forest edges, or pastures where moist, sandy soils are common and digging is easy. 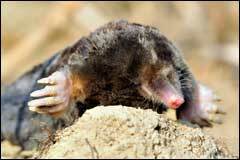 Three species of moles are native to Virginia- The Eastern Mole, The Star-nosed Mole, and Hairy-tailed Mole. The most common species in Virginia is the Eastern Mole. The type of soil, its moisture content, and availability of food can limit mole activity. Moles tend to avoid heavy clay or stony, coarse gravel soils where tunneling could be difficult. Areas with soils that are too dry or too wet to maintain the structure of their tunnel system are usually avoided. Eastern Moles prefer the drier soils of upland habitats. Moles are approximately 4-8 inches in length from nose to tail. Moles have short, powerful forefeet with broad outward turned palms and prominent digging claws, small eyes and ears, short, black or brownish-gray velvety fur, and a somewhat elongated head and snout. The tail of an Eastern mole is short and naked. The male Eastern mole is larger than the female. The hairs on the snout, forepaws, top of the head, and tail enhance a mole’s sense of touch; moles have a poor sense of smell and are virtually blind although they do detect light and dark. Many people believe that moles are rodents, like mice or rats, but they are actually members of the scientific order Insectivora, which includes animals like bats and shrews. Moles eat earthworms, snails, slugs, and insects. Moles destroy very few bulbs or plants by direct feeding, but actually dislodge plants while tunneling in search of food. Moles expend a tremendous amount of energy when constructing tunnels and will remain active day and night year round in search of food. Moles consume an amount of food equal to 60-100% of their body weight every day. To satisfy this demand for food, one mole can dig up to 150 feet of new tunnels each day. They are most active in the early morning and late evening on damp, cloudy days during the spring and fall. Moles may be seen above ground at night or when they disperse to new areas. Moles are solitary creatures. The only time moles are seen together is during the breeding season (February-March) or when a female is rearing young. After a 4-6 week gestation period, females will produce a litter of 2-5 young. Moles can live up to 4 years in the wild. Predators include snakes, skunks, foxes, weasels, owls, hawks, and domestic dogs and cats. Moles will construct two types of tunnels, those at or near the ground surface and those deep underground (6-20 inches). The network of interconnecting trails visible above ground, just under the surface, are feeding tunnels that are only used once. Deep tunnels are the highways that lead between feeding areas and the living chambers and also provide cover from predators. Eastern moles will usually create prominent ridges of heaved soil visible at the surface. Moles are extremely beneficial because they consume the larvae and adults of many pest insects, such as Japanese beetles. Their tunneling actively loosens soil, improves aeration, and mixes deeper soils with surface organic material, all which enhance soil quality. However, moles can be a nuisance when their tunneling disturbs your lawn and recreation facility. Because of the mole’s solitary habit and low productivity, most residential yards can be maintained “mole free” for many years. Sonic or vibration devices that you see advertised commercially have no effect on moles. Many “home remedies” you may have heard about, for example, gassing with auto exhaust, placing broken glass, pins or other sharp objects in tunnels, and the use of harsh chemicals, are totally ineffective, can be hazardous to residents and non-target animals, and could be illegal! The art of managing moles in yards and fields is an acquired skill. The most famous mole control job ever was conducted by a mole trapper in Washington DC, when he eliminated moles from the white house lawn back in 2001. His name was James White. He was the best mole trapper on the Eastern seaboard! Trapping is the only way to be successful at controlling moles. The traps need to be placed in very specific locations and the timing and time of year is also very imperative. There are many different mole traps on the market. They all have their place, some of them work great, and others not so good. These traps all operate under the same premise, they capture the mole as it travels through its tunnels. Weaver’s Wildlife Control has many years of mole trapping expertise and has never had a dissatisfied customer. We can tell you from experience to throw those gimmicky mole control products in the trash! Weaver’s Wildlife Control will employ an aggressive trapping program that will get a serious handle on your mole situation. We offer an initial 2 week “cleanout” for heavy infestations and an annual contract for consecutive mole control. If you have moles, then chances are, your neighbors do too! If we trap your moles, the neighbors moles will eventually find their way to your property. Encouraging your neighbors to hire us will effectively increase success in your yard and save you money. Weaver’s Wildlife Control offers discounts for multiple adjacent property trapping programs managed simultaneously. We are ecologically responsible, ensuring that only environmentally sound solutions and humane wildlife removal techniques are used for all mole removal situations.